Ospreys have reported an overall trading loss before tax of £506,494 for the 2016-17 financial year. Overall the region has net liabilities of £3.1m and directors say they expect a "significant" loss to be reported for the year ending 31st May 2018. The directors cited reductions in WRU funding and salary inflation for an operating loss of of £405,407. 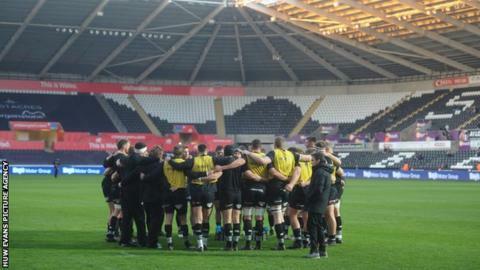 Ospreys say they are in discussions with stakeholders in an effort to negotiate their debt structure. The losses of 2016-17 mirror the previous year where losses amounted to £511,361. The Welsh Rugby Union are among the stakeholders the Ospreys say they are in discussions with, though their chairman Roger Blyth says relations with the WRU have improved. "It continues to be a difficult trading environment with increased costs outstripping the growth in revenue," Blyth said. "Given that we had missed out on Champions Cup qualification the previous season, the huge growth seen in ticket revenue was extremely pleasing, although the impact was felt in other areas of commercial activity which show a small downturn. "As highlighted in the 2015-16 accounts, the ongoing financial imbalance in the game continues to have an effect, with English and French clubs continuing to enjoy the benefits of lucrative broadcast and commercial deals while, within what was the PRO12, our Irish, Italian and Scottish counterparts benefit in terms of greater governing body support. "Moving forward, the introduction of South African clubs to the expanded PRO14 and new competition commercial deals including broadcast income will assist but there remains a substantial deficit to close. "Likewise, the relationship with the Welsh Rugby Union has been much improved and is far more inclusive. However, discussions aimed at securing increased long-term funding remain ongoing. "Resolution of these discussions continue to be a priority for the whole of Welsh rugby." Turnover increased for the region from £9,103,541 in 2016 to £9,251,702 in 2017.